Something is seriously amiss in the state of management today. More and more CEOs are failing, but the dearth of CEOs capable of placing their companies on a sustainable footing is as much a symptom as a cause of the malaise affecting corporate management. The true crisis in leadership is the stagnant state of corporate leadership development. Because companies don't properly hone their unit managers' leadership abilities, they never fill their succession pipelines. And because unit managers are stagnating, companies have difficulty executing at every level, compounding the crisis. 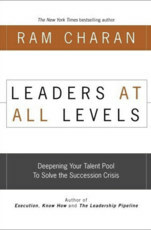 Ram Charan shows how top companies approach leadership development as a core competency. Leadership development must be a hands-on activity, integral to the business and involving leaders at all levels.